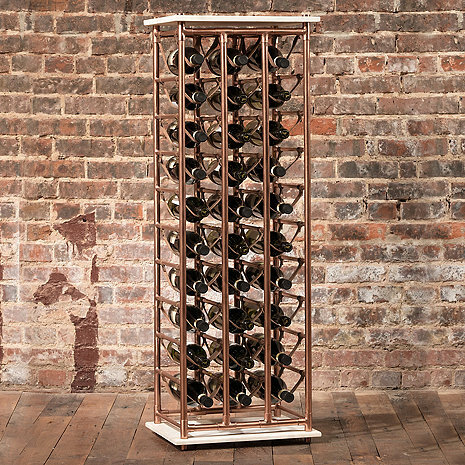 Genuine leather, sleek marble and rose-gold plating effortlessly combine to create to this contemporary wine rack that stores up to 30 wine bottles. Modern and minimal, its chic design easily coordinates and complements existing furniture and décor. A simple solution for wine storage in space-limited rooms or areas. What are the dimensions of this piece? Height, width, and depth, please. BEST ANSWER: The Saxony Wine Rack dimensions are 48 inches high by 17 inches wide by 14 inches deep. does the rack come assembled? BEST ANSWER: The Saxony Wine Rack requires minimum assembly. I have attached the assembly instructions for you. How wide is this wine rack?